The 3D modeler with the fastest, fully integrated ray-tracer. Because "rasterization is so 20th century™"
Please, like the the EQUINOX-3D Facebook page. As our artist said: "all engineers should be forced to use the software they write". I use EQX many hours a day and there is no need to force me! Super-fast photorealistic renderer, the first fully integrated interactive ray-tracer in a modeler. You can do full editing/modeling on ray-traced windows! Powerful CAD/CAM features, 3D printing and laser-cutting support. - Super fast importance-sampled HDR environment light support. - Code generator that can automatically create billions of variations per shader type from the user interface settings! No need for hand-coding Cg shaders or for using external programs that break the artist's workflow. "It's so nice to have an application that installs so easily under Linux!" Clean, easy to use and fast user-interface (UI). 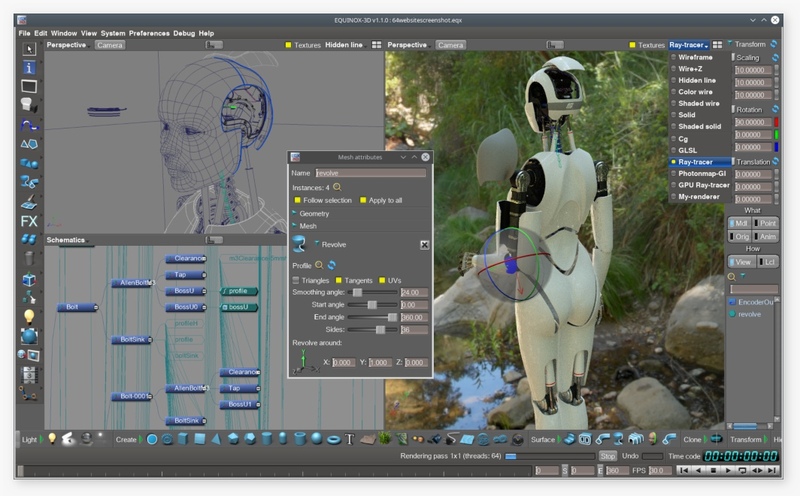 EQUINOX-3D is often called "the free modeler with by far the best UI". Try this with other modelers! Other modeler companies eventually end up with unmanageable code, need to throw out their product and start from scratch every few years to keep up with advances in 3D graphics. EQUINOX-3D has been built on a heavily runtime-typed "evolvable" core since the 1990s. There was never a need to redesign it from scratch in the many years it has been under development. EQUINOX-3D is more like a "3D operating system" than a monolythic application (over 90% of it is plugins), which allows for adding anything from an integrated renderer to a new modeling tool-kit, as plugins. For example, it took about half an hour to "turn" EQX into an XML schema viewer. You can also turn it into a Solar system simulator. See projects. Camera "fly-to" feature for all view-modes (3D, schematics, animation etc.). After me showing off this feature for years, it was partially copied (3D view only) in the latest version of Maya. Programmable texture-mappers: just like programmable shaders, per-pixel custom texture-mappers allow you to use your own texture mapping algorithms. This allows for things like special environment-map projections (e.g. mirror-sphere mapper) and custom, or even character-specific mappers, such as a "dragon" texture-mapper. Full high dynamic range texture and rendering support with exposure control and direct support for angle-maps, mirror-sphere maps etc. Universal, unlimited undo/redo infrastructure with support for multiple, independent operations at each undo/redo step. Plugin-manager: allows you to change, re-compile and reload plugins without restarting EQUINOX-3D. * This feature requires at an NVidia FX5700 or better graphics card. ** Might be more on slower harddisks or CPUs. "Equinox is by far the best implementation of this idea. Very nicely implemented, and a Lighting TD's dream"
We are impressed with the quality of your product and encourage you to keep this high standards in the future." EQUINOX-3D is referred to at 3dlinks.com. It's a great source of information for 3D on Linux.